Despite the health benefits many fad diets claim to have, doctors recommend that patients and survivors of cancer should just maintain a diet high in fruits and vegetables while staying active. Almost every day there is a new dietary “discovery” being touted online as the magic bullet to prevent cancer. Friends and family are full of stories they heard about someone who tried the Paleo diet, the baby food diet or some other trend, and how it worked for them. But the real question is: Does any of it actually work? The short answer, experts say, is probably not. That’s why any new study touting hard-to-believe claims should be taken with a grain of salt. 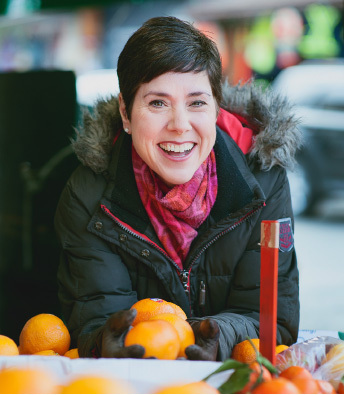 “If something sounds too good to be true, it probably is,” says Jean LaMantia, a 20-year cancer survivor, registered dietitian and food blogger. When LaMantia was diagnosed with Hodgkin lymphoma at age 27, she went through chemotherapy and radiation, but then felt at a loss about what to do next. “I got through treatment and was left with a lot of fear. It was quite debilitating. I was so afraid the doctor would tell me the cancer had come back or that a new cancer was here,” she recalls. Then she realized how she could take control of her own health: through food. Now, LaMantia runs her own blog dedicated to researching questions she has about food and those submitted by other cancer patients. She answers the questions with information from research-backed studies, not fads or anecdotes. That goes back to the old adage about moderation. For example, while recent research has linked bacon, sausage, hot dogs and other processed meats to increased risk for colorectal cancer, causing the World Health Organization (WHO) in October to classify these foods as known carcinogens, one piece of ham won’t instantly lead to cancer. Though eating a generally healthy diet is best for cancer prevention, the advice changes for patients going through treatment, which is why some may want to consult with a dietitian specializing in oncology care to get personalized suggestions. For those who want to lower their cancer risk by shedding excess weight, these experts may share insights about which diets to choose, since there is debate about the relative value of various oft-used eating plans, such as those low in fat or in carbohydrates. The benefits and drawbacks of different weight-loss plans can be hard to parse, especially in light of a 2009 study published in the New England Journal of Medicine, which compared four diets emphasizing different levels of protein, fat and carbohydrates and found that participants lost similar amounts of weight on each, experiencing improved lipid-related risk factors and fasting insulin levels, as well as similar amounts of satisfaction with the eating plans. For those undergoing specific anticancer treatments, experts might suggest some tailored dietary restrictions or additions. Patients can ask their doctors for referrals to dietitians, who often work in, or with, cancer centers or hospitals. Dietitians, who are required to complete more education than nutritionists in order to earn their titles, must have a bachelor’s degree from an accredited program and be licensed by the Academy of Nutrition and Dietetics. Suzanne Dixon, epidemiologist, registered dietitian and past chair of the Oncology Nutrition Dietetic Practice Group, has spent years working in research, clinically and as a consultant. She notes that, during treatment, keeping weight on can be a bigger challenge than taking it off. At such times, getting down any food can be difficult, so Dixon suggests bland fare that is easy to swallow, like soup or yogurt — and then returning to a more normal diet as soon as possible. “There may be a few days of comfort eating, but then you want to get back on track,” she adds. That can be extremely difficult, depending on the type of cancer someone has. For example, patients with head and neck cancers have a particularly hard time getting the right nutrition, Dixon says. In worst-case scenarios in which they can’t get enough nutrition, they may need to rely on a feeding tube. “If those folks waste away and lose a ton of weight, they can’t get their treatments and will do really badly,” Dixon cautions. While some cancer patients are worried about getting enough nutrition, people with breast or prostate cancer actually tend to gain weight during treatment, Dixon points out. “It’s a totally different problem than someone who is malnourished, but you still need to address it,” she says. Treatments for those cancers may slow the metabolism and cause patients to lose muscle mass and bone density. Gaining weight after diagnosis can be associated with bad outcomes and reduced quality of life, which is why Dixon says that any amount of exercise during treatment is important. Cancer can often be a wake-up call for patients to change their way of life. That was the case for Diana Dyer, who has survived two battles with breast cancer and now runs her own organic farm with her husband in Ann Arbor, Michigan. She also wrote a book called “A Dietitian’s Cancer Journey,” whose proceeds she donates to research. After her second diagnosis, she added more fruits and vegetables to her diet and cut down on meat. That doesn’t mean she deprives herself of what she wants, though. She doesn’t call this strategy moderation, but refers to it as a series of intentional choices. Like LaMantia, Dyer saw food as the way to get her power back after cancer. As far as specific foods to eat or not eat, Dixon says people should be limiting their intake of red meat because of its association with certain digestive tract cancers such as rectal, colon and stomach. In fact, the WHO recently classified red meat as “probably carcinogenic” to humans. “Ten to 15 ounces of red meat a week, or below, is not a problem, but over that, you start to see colon cancer risk going up,” she says. Not just the kind of meat you eat, but the way you cook it, matters, experts say. Looking at your plate, Dixon says, you should see it covered more than halfway with plant foods, and the rest with lean protein like chicken or fish. “Most people say, ‘I’m going to have chicken: What should I have with it?’ Instead, make a big colorful stir fry with lots of vegetables, and ask, ‘What kind of meat can I put in it?” she says. “It’s a complete shift in how you see meal preparation." Anne McTiernan, a doctor and Ph.D. researcher with the Fred Hutchinson Cancer Research Center in Seattle, wants to see more research dollars directed toward studying the links between food and cancer. “I think it is really critical to look into treatments for cancer, but if we are not looking into what causes it and trying to prevent it, it’s a little bit like trying to fight a forest fire while somebody is at the other end of the forest lighting matches,” McTiernan says. Some of the facts are already in. Lower-acid foods, such as fresh fruits, vegetables, nuts, legumes and root vegetables, contain prebiotic nutrients that nourish good bacteria in the gut, decreasing inflammation throughout your body that might otherwise contribute to cancer. Also beneficial can be soy, eaten in moderation, which studies show is associated with a lower incidence of breast and colon cancers. On the flip side of the coin, alcohol, while good for getting relaxed, is full of empty calories that contribute to weight gain, another cancer risk factor, says McTiernan, who suggests not having more than one drink a day. The jury is still out, meanwhile, on whether dairy or artificial sweeteners can raise cancer risk, and whether organic foods, green tea, the antioxidant lycopene (which is plentiful in tomatoes) or low-fat or macrobiotic diets can reduce risk or aid in recovery. Some studies have indicated that coffee may have a protective effect against specific cancers or their progression or recurrence, among them prostate, endometrial, liver and oral cancers. It’s not entirely clear whether this is due to coffee’s caffeine content or to the antioxidants it includes, which are compounds that help cells stay healthy. Although there has been a lot of study about whether dietary antioxidants can help prevent cancer, randomized clinical trials have yet to provide much evidence that they help, according to the National Cancer Institute. Still, some experts, including Dixon, recommend eating foods that are high in antioxidants, including vegetables like broccoli, cauliflower, chard and kale. Patients may want to ask their doctors if there are any foods that will interact negatively with medications they are taking. One possible example is grapefruit juice, which can interfere with the action of a number of targeted drugs, including Xalkori (crizotinib) for non-small cell lung cancer and Sutent (sunitinib), which treats kidney and some other cancers. Also check in with health experts before taking natural supplements like vitamin D — in which most cancer patients are deficient — or vitamins B, C or E. While these are available on the market, they aren’t a cure-all. Cancer patients should talk to their doctors before starting a course of supplements because, although some can be helpful, there is such a thing as too much of a good thing, Dixon says. There are always fads patients ask about, including juicing and the Rainbow and Gerson diets, which do push plant-based foods but have other drawbacks compared with an overall healthy and balanced diet, according to LaMantia. The latest tactic Dixon has heard about is fasting. While the idea is still new, the theory is that, when you fast, your healthy cells go into housekeeping mode and your metabolism slows way down, but cancer cells — as is their nature — continue their uncontrolled growth. The hope is that fasting on the days before, during and after a chemotherapy treatment will allow the medicine to target more cancer cells for destruction and do less damage to healthy cells, Dixon says. Evidence supporting the technique is limited, although fasting did look promising in mouse studies and a phase 1 study in people receiving chemotherapy, conducted at the University of Southern California. It’s not something you should try without talking to your dietitian, Dixon says. “If you don’t know what you’re doing, you might make yourself weak or dehydrated,” she says. Overall, it is important to make changes to your diet in a way that you will be able to stick to after cancer, and doing it cold turkey is not always the best practice. And don’t worry that one particular meal, or a certain eating pattern over time, is what led to your cancer. While there are broad associations between cancer and certain eating habits, that doesn’t mean those habits always cause cancer to arise, or that they are the only potential drivers of the disease.